Students in 3 Maine towns thought they had little in common. Then they started talking. Connie Carter leads a discussion with Orono Middle School students, including Athena Saucier (to Carter's left), as part of Operation Breaking Stereotypes. 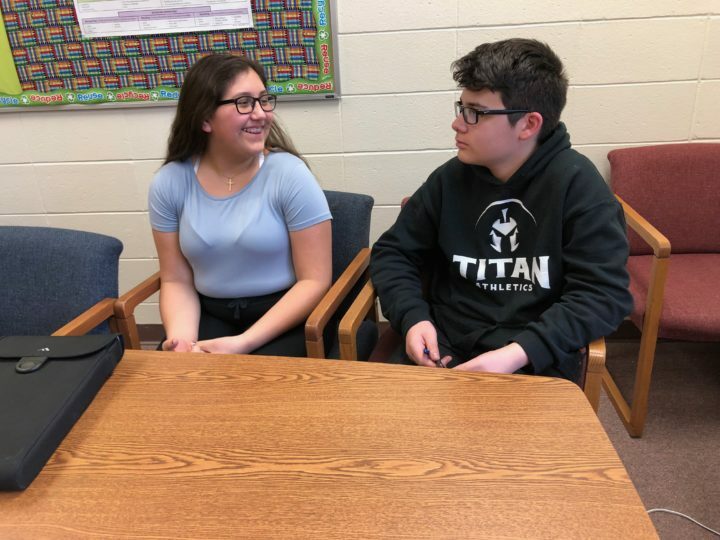 Middle-school students from Orono, Old Town and Indian Island meet with Carter once a week to participate in the program, which aims to bring students from different backgrounds together so they understand each other. Every Thursday, Connie Carter visits three middle schools in neighboring communities with the same goal: to help students at each school see past the negative stereotypes they might hold about the other two communities. 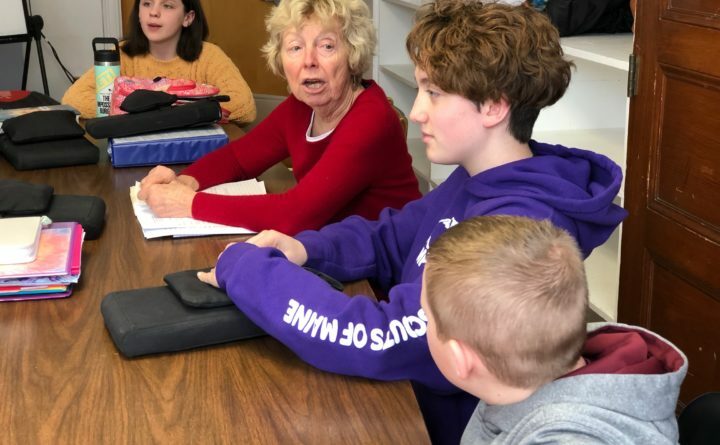 Once a month, she also brings the students from Orono, Old Town and Indian Island together at one of their schools as part of Operation Breaking Stereotypes, a nonprofit the 71-year-old former teacher co-founded and runs, so they can get to know each other and discuss difficult topics. It’s an idea Carter hatched with her daughter two decades ago to help students from different backgrounds understand each other. Its original design has since changed, but the underlying idea hasn’t — that students have more in common than they might realize with students who come from backgrounds that, on the surface, appear insurmountably different. When Operation Breaking Stereotypes started, Carter was a teacher at Orono High School and her daughter taught in the Bronx, so the first partnership was between Orono High School and the Bronx’s Walton High School. But Carter later shifted her sights to pairing up schools within Maine. She started two partnerships in the 2015-16 school year, bringing together students from Lewiston High School and Maranacook Community High School in Readfield, and the students from Old Town’s Leonard Middle School, Orono Middle School and Indian Island School. Every year since, she has presented a different social issue for the middle schoolers to learn about and discuss. In 2016-17, it was climate change, and the next year it was gun violence. This year, they’re tackling racial and cultural stereotypes. Students from each school bring their perspectives, learn from each other and Carter, and take a better informed view back to their communities. “I know that we’re all different, but we’re still capable of getting along,” said Leonard Middle School student Olivia Neely, 14. At a round of Thursday meetings with Carter earlier this month, all three groups of students agreed that they have found a lot in common with students from the other schools. They said they have consistently found their hosts at the other schools welcoming and friendly. Those experiences break down stereotypes even more than the Thursday meetings do, the students said. “We can observe and understand that we’re all similar rather than talking about it,” said Athena Saucier, a student at Orono Middle School. Last month, Leonard Middle School students hosted the other two groups. In their discussion with Carter, the hosting students said they were glad their visitors realized the Old Town students’ reputation for being “troublemakers” was untrue. Students from Orono, Old Town and Indian Island meet with Connie Carter once a week to participate in a program she started that's called Operation Breaking Stereotypes. Here, Leonard Middle School students meet with Carter (right). School Counselor Tracey O'Connell is sitting to Carter's right. Orono students said the other schools initially perceived them to be rich and snobby, but the group meetings helped them prove that stereotype wrong. “It’s good that we’re doing this because we’re showing that we can get along, and that the stereotypes don’t really exist,” Saucier said. For Indian Island School students — who live on the Penobscot Nation’s reservation — it’s important to dispel commonly believed stereotypes of Native Americans. Like their Old Town and Orono counterparts, the Indian Island students pointed out, they wear modern clothes, live in houses and they don’t just eat corn. Carmella Bear and Avery Lolar from Indian Island are pictured during a weekly meeting for Operation Breaking Stereotypes. At the latest Thursday meeting, Carter explained the history of Native Americans’ unfair treatment to Old Town and Orono students. It was evident from the middle schoolers’ reactions that they were actively trying to educate themselves and respecting Native American culture. Some students who have been in the program with Carter for a while told the others that they appreciated Indian Island School for the ways in which it was different from Leonard and Orono middle schools. “Their culture is built into their school,” Neely said to Carter at Leonard Middle School. An hour later in Orono, Katherine Kohtala was thinking along the same lines when Carter asked what the Orono students had learned from visits to Indian Island. “The history of their school is pretty much the history of their culture,” she said. During the discussion, one student brought up Columbus Day, which Orono now observes as Indigenous Peoples Day. “[The three schools] coming together isn’t just breaking the stereotypes,” said Leonard Middle School student Natalie Blockburger, 13. “We also have to understand the reasons behind the stereotypes,” added Tyler Nash, 14. Next month, all three groups of middle schoolers will meet at Indian Island School for a day of shadowing the host students and attending classes with them. Saucier of Orono Middle School was thinking beyond simply fostering understanding among three schools in neighboring communities. Correction: A photo caption on an earlier version of this story gave the wrong last name for Avery Lolar.